Recently we asked some new clients what factors led to their decision to pick us for their corporate video production in Dallas, Texas. We’re always glad they picked us, and trusted us to handle their video project, but we’re even more happy when the project ends and we’ve beat their expectations. Some clients searching for a video production company are concerned that they’re entrusting their story.. their message… their brand, to someone who doesn’t have a lot of experience in the industry. Many business people understand that to become experts in an area, it takes much repetition and practice. (Making the library of many corporate execs is Outliers by Malcolm Gladwell, and this philosophy is a foundation for what he espouses.) So our clients tell us that we were selected because of our experience. Our Producer/Director Daniel Millican started working in corporate video communications in the 1980’s. That’s 30 years, hundreds and hundreds of projects, thousands of videos, and a myriad of awards and recognitions. This comforts that director of marketing looking for the right team. In this age of communication, it’s imperative to connect to a real person as quickly as possible. At Serendipitous Films, we have our main phone number (214-307-2882), which is forwarded to two different people at all times. We aren’t always able to pick up on every call, but we return messages quickly. Our clients have commented on how responsive we are. That’s because when we’re looking for a product or service, we want someone their to take our call, answer our questions, help us out. So we’re committed to that for our clients as well. Our clients tell us that we often over deliver in what we promised. This is the key to exceeding expectations. We take a lot of pride in what we do and it shows. Lastly, we’re the nice guys. We do great work and we have fun along the way. Life’s too short to create a stressful, drama-filled atmosphere. We enjoy tough deadlines and crazy objectives. 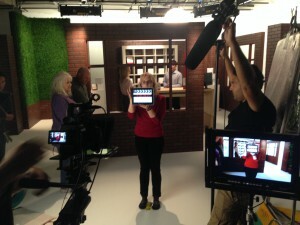 If all this sounds good for your next corporate video production, gives us a call and check us out. We’d love to work with you.